In July 2012, my Facebook page was created as a platform for sharing pictures of activities/programmes & sharing ideas with friends & colleagues. In August 2013, I got my first thousand likes. In January 2015, there were 2000. 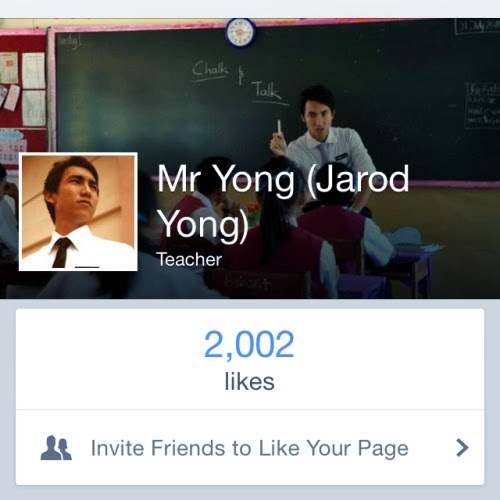 It's nothing compared to other teachers who have achieved more than 5 digits but I want to be thankful for the 2000 people who decided to publicly endorse me & my work. To them, what I am doing matters & it is such a booster! My Facebook page hasn't changed much since from its inception. I'm still sharing pictures of stuff I did, useful/interesting articles & the good work of other teachers. Nowadays, I'm including more personal development articles because I believe that one person's level of success is parallel to their level of personal growth. If you want to lead a classroom, a superior ethos has to shine through. As I grow, I want others to grow with me. Honestly, having 2000 & counting supporters is a big encouragement to me. I just hope that I'm returning the favour by sharing with you quality content that helps you to learn something new or think deeper about overlooked issues. Also, I'm always looking to improve. If you have any feedback about how I can make things better for you on my blog or on my Facebook, contact me or write a comment below. Truth be told, I refuse to think that I am anything more than a common English teacher. There's nothing special about what I'm doing or who I am. I hope that when you look at what I have done & achieved, you'll see yourself doing the same things. I'm not anyone special. I'm just like you. I do simple but significant things which anyone can adapt & do in their own way. I don't mind people copying what I'm doing as long as it makes a difference to their students. Currently, I'm making it easier for people to access my thoughts & ideas on my blog so that they may take & apply whatever that resonates with them. (Notice the new blog menu?) I'm not going to charge. Neither am I going to hold back what I know. All I ask in exchange is for you to share when someone else needs your help. Pass it on. It's kind of like a pyramid scheme which changes the world for the better; making a lot of difference instead of making a lot of money. Wouldn't you be proud to be part of that? Wishing everyone reading this all the best as we gear up for a new academic year next Monday!! Looking forward to tormenting my poor students!! HAHAHAHAHA!! !